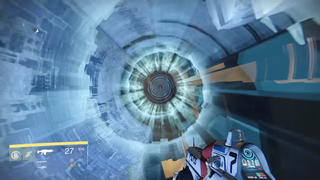 For weeks now, Destiny players have been glitching into walls and finding secrets that they weren't meant to see. Buried in the game's files are all sorts of hidden zones that you can't access normally, some of which will be used for Destiny's upcoming downloadable content. That's right—Destiny has committed one of gaming's cardinal sins: On-Disc DLC. On-disc DLC—that is to say, content that's on a game's disc but is locked until you download more files and potentially pay more money—has become taboo in the video game world for a number of reasons. For one, there's the whole psychological element—if you're paying for a video game, you'd expect to be able to access everything that's on the disc you bought. More importantly, the very idea of DLC being ready in time to ship alongside the main game would imply that the game's developers cut out that content to be sold separately. Of course, there are all sorts of possible factors in play here—there are scenarios where parts of a development team might start work on DLC while other members of the team are finishing up the main game, therefore allowing some early assets to ship with the disc. In this case, it's clear that most of the unfinished zones aren't quite fully baked yet, and there's no clear evidence that Bungie cut out planned content just to sell it later. I'm sure you sure the recent leaks with players able to see a lot of this planned content already in the game. Based on what you've told me, a lot of that doesn't seem to be in The Dark Below. Harold Ryan: There's a bunch of shared-world content we've shipped on the disc specifically to limit download sizes for people. Both inside the US and all over the world, how much you download on your local home internet connection can be a problem, and even how much storage space it takes up on your console. So we share a lot of assets across all the activities in the game. When people get into areas that aren't unlocked right now, they're seeing pieces we built and shipped ahead of time, but they're by no means the finished experiences or even the finished content. But when we can get into these areas already and see this content, there's a feeling at the content is finished, cut and saved for DLC. Harold Ryan: No. Eris and her story were built over the last three months, long after the game was done. For example for The Dark Below, that included the activities and the bosses and all of the polish of it. Satisfying explanation? Irritating non-answer? You be the judge.